If you didn’t follow along on this site or my Twitter account during filming of the “Bachelorette” between March 15th and May 10th, a lot of this will seem brand new to you. If you did, pretty much everything you see today will be stuff you’ve already seen, outside of a few dates. It certainly was one of the more interesting seasons in regards to public spoilers, since pretty much every date outside of three were spoiled publicly. Either by pictures sent to me privately, or by public dates where plenty of fans were able to be present on dates and take pics. This includes basically every date in Las Vegas, Virginia, the Bahamas, and hometowns all getting out publicly. That definitely has never happened before. Once overnight dates started, things died down in Thailand, although I do have a couple pictures today from Becca and Garrett’s date that I haven’t posted yet which I received last week. Then of course, this is the first time the paparazzi ever had pictures of the final rose ceremony and released them before the first episode ever aired, so you actually have your proof this season as to who the winner is. Only other finale I remember where there were pictures of the finale were Ben and Courtney, but those weren’t released until closer to the finale. I only have some of the early group date roses, because honestly, I forgot to ask after a while. There might be one elimination I might have wrong, and that’s in episode 3 & 4. There might be a guy that lasts one episode longer than episode 3, or one episode shorter if it’s episode 4. I think what I have is right but I could be off by one person. But knowing the 12 guys that made it to Vegas, from that point forward everything is correct. Before we get started, for all those who haven’t been following along the last 2 months, here’s what you need to know about Lincoln. Life & Style magazine ran this story back in April. Yes, it’s completely disgusting. And yes, since that story ran, I’ve had THREE Oracle employees that worked with him in the Burlington, MA office email me personally and confirm that this is true. I mean, it would take a really sick person to just make that up. Although, the fact he even does this is sick in and of itself, but the story was so unbelievable NOT to be real, you know? So from people who worked with him, they still don’t understand his motivation for it (one said it might’ve been a germ thing, and one suggested because Lincoln is in such great shape it could have something to do with fitness), but he would build his “nest,” defecate on that nest, then pick that up and flush it down the toilet. Whew. And until I heard that, I thought he just did it on the nest and left it for the janitors to pick up. I may or may not have actual pictures of this that have scarred me for life in case you’re wondering. The way people knew this was because of the multi stalls in their public bathrooms. Obviously you can see the legs and feet of the person next to you when you walk in, so they could clearly see his feet and his “nest” on the floor when they walked in. This story is seriously the weirdest thing I’ve ever heard when it comes to this franchise, and that’s saying something. What’s even worse? Since the mansion itself is just a regular bathroom, and when they traveled they’re in suites that have regular bathrooms and aren’t multi stalls, technically Lincoln could’ve been doing this all season and nobody would’ve ever known, since there aren’t multi stalls for people to see under. I have no idea if he did, but it’s frightening to think this guy could’ve still done it on the show. I have no idea why he does it and I don’t wanna know. Lets just get to the spoilers. I’m feeling sick already. Group date: 8 guys dress up in tuxedos and compete in an obstacles that test their abilities to be a groom. Rachel & Bryan are there to instruct the guys on what to do. The 8 guys are: Nick Spetsas, Lincoln Adim, Clay Harbor, David Ravitz, Jordan Kimball, Chris Randone, Connor Obrachta, and Jean Blanc. Here were some pics from that day courtesy of JustJared.com. Jean Blanc got the group date rose. 1-on-1 date: Blake Horstmann. Becca and Blake wear welder’s masks use a sledgehammer to destroy things representing her relationship with Arie. Lil Jon performs “Turn Down For What” as they do this. Blake gets the rose. Green Team won best 3 out of 5 easily. Then they made it best 4 out of 7 and they still kept winning. Fred Willard provided commentary on the date like he did last season for the dog show. Wills got the group date rose. During the after party is where Colton tells Becca that he was in a relationship with Tia pre-show. As mentioned back when I first broke this, I still don’t know how Becca had no clue. Becca and Tia and Caroline were all together in Florida the weekend before Tia and Caroline flew to LA for the WTA taping. Girls talk, right? You talk about guys you’ve been with, no? Especially someone you may have just been seeing? I mean, if you want to suspend disbelief and say Tia and Colton didn’t start up until after that weekend, there’s just no way. That WTA was taped end of February and Becca’s season started filming March 15th. So Tia and Colton were most definitely seeing each other before then. Hell, maybe she never told Becca there was a guy in another state she was seeing. I guess it’s possible? Whatever the case, this after party is where Colton brings it up, which sets up next week’s group date where they make sure to have Tia on it. It was either this episode or episode 3 where David Ravitz fell off the bunk bed in the mansion, breaking his nose, suffering a concussion, and even had bleeding on the brain. That’s the ambulance you see in the season preview. He missed a rose ceremony, but obviously returned since he was on the 2-on-1 in Vegas. Rose Ceremony Eliminations: Alex Templeton, Trent Jespersen, and Rickey Jasper. Group Date: The guys get mani’s and pedi’s from Becca’s friends: Tia, Seinne, Bekah, Caroline, and Kendall. On this date is where Colton, Tia, and Becca have their talk, and obviously it leaves on a good note, since Colton is kept around. 1-on-1: Chris Randone. They visit Capitol Records and have a song writing session with Richard Marx. Chris got the rose. Really? Let me guess, they sing “Right Here Waiting” 400 times, too. I mean, it’s his only song anyone knows. More amazing Richard Marx facts? He was married to Penny from “Dirty Dancing” for 25 years and they have 3 sons. And a year after the divorce, he married Daisy Fuentes. Group Date: Football at Ventura College. 5-on-5 game that ends in a tie. Keyshawn Johnson, and Lingerie Football League players helped coach. Clay ends up breaking his wrist during this game and being taken to the ER. He had received the group date rose but ended up having to give it back to leave and have surgery, thus eliminating himself. Rose Ceremony Eliminations: Ryan Peterson and Mike Renner. Clay Harbor eliminated himself earlier in the episode. Group Date: Only date I’m not sure what they did, but in the preview, I believe they were all dressed in red & black flannels and split up into teams. All the guys were on the date except Garrett and Wills, who had the 1-on-1’s this week. 1-on-1: Wills Reid. The two of them go snowmobiling. Wills got the rose. Rose Ceremony Eliminations: Nick Spetsas, Christon Staples, and Jean Blanc. Kinda hoping that Wills might be next bachelor based on night 1 and these spoilers. Jason just does not seem likable enough and Blake just seems too blah. This season is already tainted by knowing she picks Garrett.. I’d have more respect for her for pulling an Arie and dumping him than defending him and staying with him out of obligation to the show. Peter. Peter. Dont you omit Peter out of the Next Bachelor’s list,Steve! 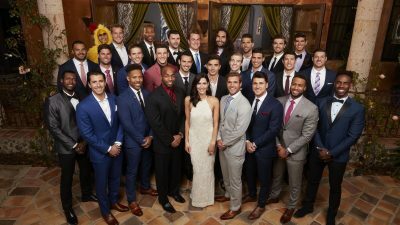 I’m not sure who should be the next bachelor till I watch more of the bachelorette. I think she was in love with two guys after watching the videos. Garrett should have never said he was sorry, but I know he did it, he’s part of the franchize so he was trying to save the brand from irrational feedback. Left-leaning tv makes fun of conservatives all the time, just ask the President. Garrett’s likes were posts that were poking fun at the left. What Garrett’s going to realize, the left is going to make sure he’s in line with their views. Mike I’m a conservative and mocking people who are different and spreading conspiracy theories are not what I would consider conservative viewpoints. Conservatives care about lowering taxes and reducing the role of government, etc. If you think otherwise you are not a conservative. Garrett’s likes are a reflection of the way he thinks and feels about others. His apology is a joke. Definitely scripted by ABC to control the damage. Now we are hearing from the ex-wife’s friends that he basically walked out on her. Becca deserves better. Hopefully she will realize this even if it’s not until the season is over. P.S didn’t know about new drama with ex wife’s friends saying he walked out on her, that’s unfortunate if it’s true…. It is now mid-July and if you’ve continued to watch Garrett does open up to Becca about the toxic relationship with his ex. I’m sure they’ve had many more in depth conversations. Becca is a smart lady who has weeded out the dram. I highly doubt she would’ve kept Garrett around if she felt he wasn’t honest about his past. And of course the ex’s friends are going to blame him for the failed marriage. Do you think they’re going to say she is a wack job? I tried searching but couldn’t find anything. I see that you said Colton had questionable motives going on to Becca’s season. What were some of the motives he had if he 100% wasn’t on the show to find love with Becca? I’m just curious! Thanks!